Pixar's "Experimental Storytelling Initiative", SparkShorts continues to showcase the creative works from the talented individuals within the studio. VP of Development and New Media, Lindsey Collins noted that the program allows for the studio to start thinking about the future storytellers, directors, and producers, "who are they? and how do we get a sense of who they are right now?". Today, a second SparkShorts film has been released on YouTube and YouTube Kids. Smash and Grab, directed by Brian Larsen and produced by David Lally explores the life of two antiquated robots after years of toiling away inside the engine room of a towering locomotive the duo will risk everything for freedom and for each other. Pixar SparkShorts Production Lead, David Lally noted (via Twitter), "By design, #SparkShorts can be a bit edgier and more experimental. This is an exciting opportunity for our artists and we hope you all like the stories too! The first 3 are rated PG, so check them out before letting younger viewers watch! Enjoy! :)"
The program currently lists six films (as shown below), however, this list could grow quickly as the filmmakers are given a small, six-month time frame and a small budget to create their own personal film. Kristen Lester, writer/director of Purl had the best definition of the program, noting, "SparkShorts is Indie filmmaking inside of Pixar". Smash and Grab — Directed by Brian Larsen, produced by David Lally and lighting DP Farhez Rayani. Synopsis: After years of toiling away inside the engine room of a towering locomotive, two antiquated robots will risk everything for freedom and for each other. Kitbull — Directed by Rosana Sullivan and produced by Kathryn Hendrickson. Synopsis — An unlikely connection sparks between two creatures: a fiercely independent stray kitten and a pit bull. Together, they experience friendship for the first time. Float — Directed by Bobby Rubio and produced by Krissy Cababa. Synopsis — A father discovers that his son floats, which makes him different from other kids. To keep them both safe from the judgment of the world, Dad hides, covers, and grounds him. But when his son’s ability becomes public, Dad must decide whether to run and hide or to accept his son as he is. Loop — Directed by Erica Milsom and produced by Krissy Cababa and Michael Warch, along with supervising TD and lighting DP Danielle Feinberg. Synopsis —A non-verbal, autistic girl and a chatty boy are partnered on a canoeing trip. To complete their journey across an urban lake, they must both learn how the other experiences the world. Wind — Directed by Edwin Chang and produced by Jesus Martinez. Synopsis — Wind is a magical realism story about a Grandma and a Grandson trapped in a massive, never-ending sink-hole, living on a large boulder suspended by strong winds. Together they scavenge falling debris to build an escape, hoping to find a better life in the outside world. Last month, the first three films (Smash & Grab, Purl, and Kitbull) were shown at the famed, El Capitan Theater on January 18, 2019. Now those same three films will be released on YouTube (shown below). What are your thoughts on the new SparkShorts program? Share your thoughts on Smash and Grab with other Pixar fans in the Pixar Post Forum or in the comments below. 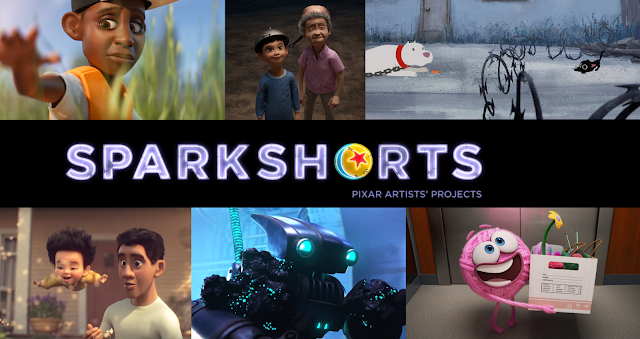 Pixar Post - Julie & T.J.
Pixar's SparkShorts initiative released their second film. Today, Smash and Grab was released - read more about it and watch it here.